I was among several friends who have been wanting to try Perpetuum for a long time. 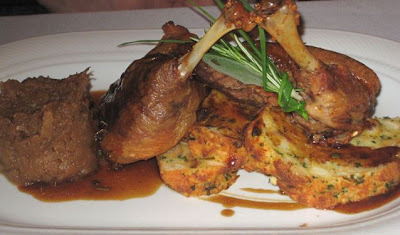 We'd all heard good things about this upscale place specializing in duck in Dejvice. We wanted to make a group visit. But it wasn't until recently that the stars aligned and our schedules collided. V and I got there first and walked down the steps by the bar into the dining room. There were six of us, and we were given our own room. The restaurant was pretty quiet that night. Only two other tables were occupied. Eventually, our group was assembled. It was quite dark there, and some had trouble reading the menus. I held mine up to the light and had to read the offerings out loud for the table. 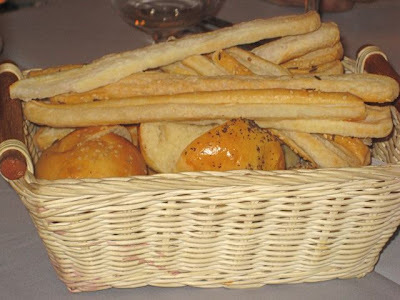 We were given a breadbasket. It had some decent rolls, but I was partial to the bread sticks. On the side was something pretty unique. There was a little dish filled with cold duck fat, mixed with slivers of duck meat and vegetables. I thought it was delicious, putting all thoughts of the cardiovascular implications out of my mind. It was an interesting twist on the Czech tradition of serving pork fat before meals. 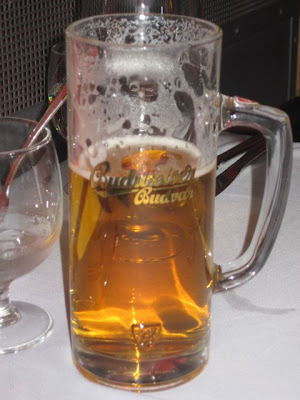 The beer on tap was Budvar 12 degree. It was 40 CZK for a half-liter. 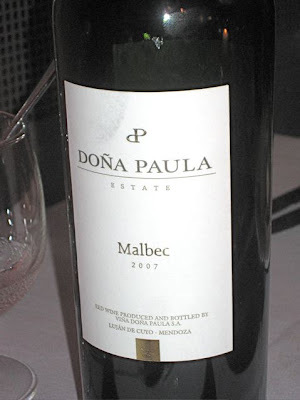 Others ordered a bottle of wine, a 2007 Malbec from Doña Paula Estate (790 CZK). Everyone was happy with it. There were a few wines in the sub 1000 CZK category, but many that were higher. We wished for a few more economically priced options. 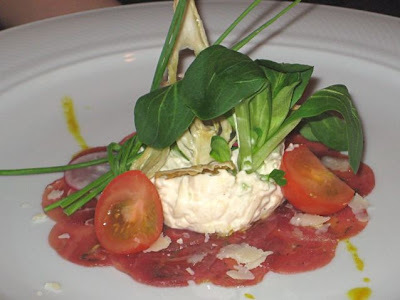 For a starter, V had the duck carpaccio (140 CZK). The delicate, thin red slices vanished quickly off her plate. But perhaps the most interesting was the apple-celery salad in the middle. Really lovely flavor, with a very light, extremely creamy texture. 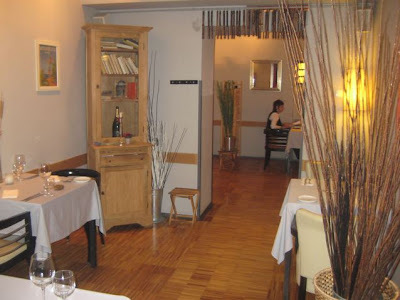 I had the duck breast marinated in a Madeira reduction (150 CZK). It came with a tartare of plums, served with pineapple cooked in aged aceto balsamico. The meat was very flavorful, and the fresh pineapple was a nice touch. But I did like V's better. 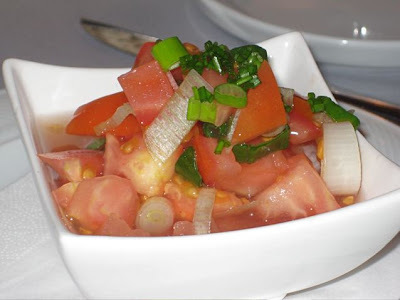 Four of our group had the sweet and sour tomato salad with spring onions and chopped chives (60 CZK). 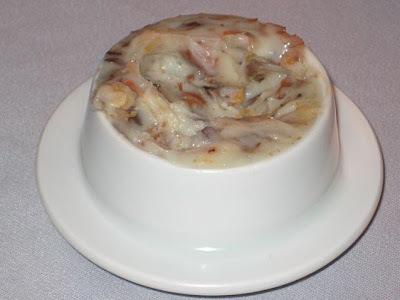 It is listed as a side order, but the restaurant was happy to serve it as an appetizer. The consensus was that it was quite sweet, but that was to be expected, given the menu description. For a main course, three people ordered the half home-bred duck with stuffing, apple–white cabbage marmalade, and a sage sauce (380 CZK). You can also get just a quarter duck (280 CZK). J said it was "beautifully cooked," crispy on the outside, moist and tender inside. "It's amazing how such a tradition dish can shine in the hands of a bright chef," he said. "The combination of the apple and sauerkraut with the stuffing really helped make it special. This dish was on "The Chef Recommends" section of the menu. Everyone who ordered it also agreed they'd recommend it, as well. V loved it. 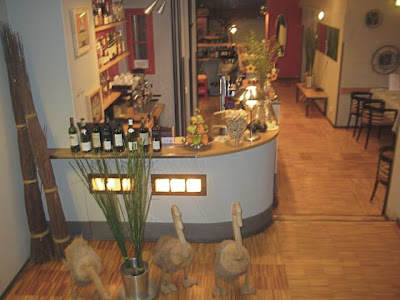 L had a quarter of a roasted duck with vegetable pancakes and mushroom juice (280 CZK). I didn't try it, but it looked good, and she said she liked it. 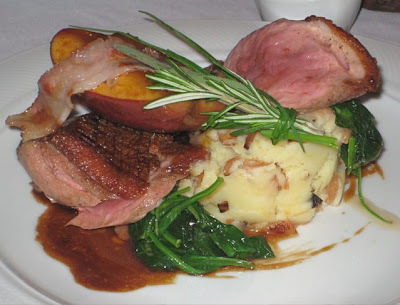 I ordered the grilled Barbarie duck breast on mashed potatoes with smoked onion, stir-fried spinach and a caramelized apple (360 CZK). The meat was served medium rare. The breast was not so tender, so a sharper knife would have helped. It was fresh, but somewhat bland by itself. But that issue was solved when I combined it with the apple, which I cut up into small, bite-sized pieces. 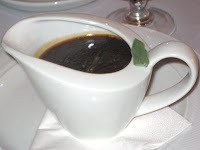 There was also a pitcher of thick, rich duck gravy that I added to make it even better. I thought the wilted spinach was cooked just right. It was warm, but still had some crunch to it. It said the dish came with pancetta, but it looked more like a slice of bacon. I enjoyed the dish, but I think I'd go with what V and the others had next time. 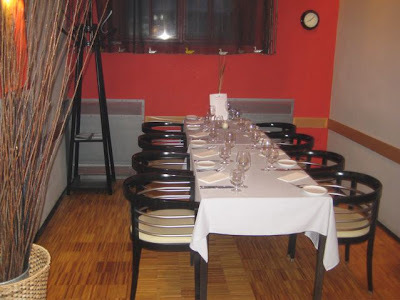 The tab for the six of us was 4260 CZK. We thought it was a good value and a fair price. That included several after dinner drinks, coffee, and tea. Including tip, it worked out to 800 CZK per person. Everyone loved the food and the style of the place. The service was efficient, friendly, and unobtrusive. There was no sense of impatience, even though we lingered quite late, engaging in a friendly, but pointed political debate over the coffees. 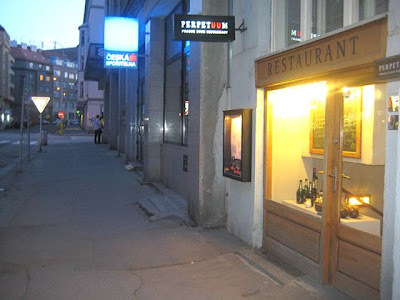 In a place like Perpetuum, one must realize that somewhere close by the placid domain of the dining room, a few people must be working pretty hard behind the scenes to make it such a pleasant and flavorful experience. interesting review, gotta try this place. 2) you managed to have some fun, even discussion. So are you reviewing for expats on a permanent basis now? Sorry, but this is not a really professional place. Service is kind but very amateurish. 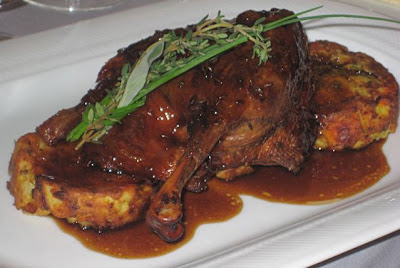 The food is average (at best) and when you call yourself a "Duck Restaurant" the duck should be good. It is not! Unfortunately it is over cooked and with a lower level of culinary knowledge. Stay away is my advice!